The Samsung Galaxy A8 is here. It’s an affordable smartphone, slotting just below Samsung’s flagship S-series price-wise. We got our hands on one recently, and we were massively impressed by its premium features – especially as quite a few seem to have been lifted straight from Samsung’s recent S8 flagship. Here’s what we made of it. The A8 isn’t far off the S8 in terms of look and feel, with its glass front and rear and metal frame. The upper and lower bezels have been cut right down, giving a screen-to-body ratio of 75.6%. That comfortably beats the 72.1% on the Galaxy S7 – Samsung’s 18-month old flagship. Switch the A8 on, and you’re looking at a 5.6-inch Super AMOLED display with Full HD+ resolution. As you’d expect from Samsung, it makes for a great viewing experience. It’s bright, colourful, and packs a real punch. The A8 is also Samsung’s first mid-range phone to feature the trend-setting 18:9 aspect ratio. A lot of new movies and shows are shot in the same ratio, so you get to see more of the action. The A8’s camera set-up is unusual, to say the least. It’s almost as if it was designed by the world’s biggest selfie fan, with a dual camera on the front, rather than on the rear. These dual front cameras (8MP + 16MP) work together to create stunning selfies with professional looking blurred backgrounds. 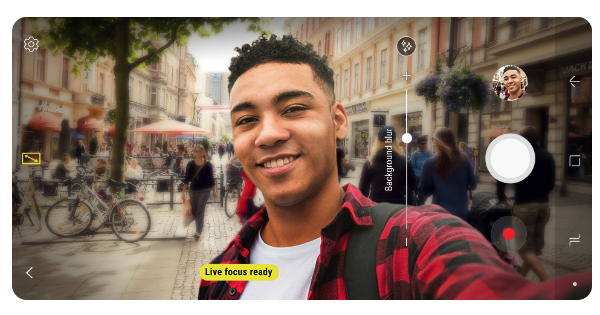 With Samsung’s Live Focus feature, the effect can be adjusted even after you’ve taken the shot. You can probably guess where this piece of functionality first appeared – the S8. The rear camera weighs in at 16MP with an f/1.7 aperture, and it’s no slouch. We were able to take bright and colourful shots in quite dark conditions. Inside the A8 is Samsung’s own Exynos 7885 octa-core processor, combined with 4GB RAM. We expected that to give us a decent amount of speed and power, and we weren’t disappointed. Everything we tried ran smoothly, including a prolonged stint on Player Unknown’s Battlegrounds – an intense and demanding 3D multiplayer game. The final thing that the A8 borrows from the S8 is the 3,000mAh battery capacity. That’s a great size and it gave us a serious amount of battery life – more than a day and a half, on average. The Galaxy A8 is an amazing mid-range phone packed with premium features. If you’re looking for a near-flagship phone experience at a far from flagship price, and it's available to buy right now, right here. Any questions on the Samsung Galaxy A8? Post a comment below and we’ll do our best to answer it.